"Radetzky" redirects here. For other uses, see Radetzky (disambiguation). 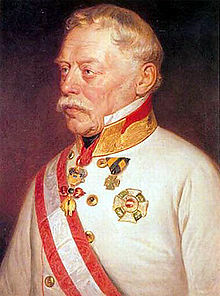 Johann Josef Wenzel Anton Franz Karl, Graf Radetzky von Radetz (English: John Joseph Wenceslaus Anthony Francis Charles, Count Radetzky of Radetz; Czech: Jan Josef Václav Antonín František Karel hrabě Radecký z Radče; Slovene: Janez Jožef Vencelj Anton Frančišek Karel grof Radetzky; 2 November 1766 – 5 January 1858) was a Bohemian nobleman and Austrian field marshal. He served as chief of the general staff in the Habsburg Monarchy during the later period of the Napoleonic Wars and afterwards began military reforms. Radetzky is best known for the victories at the Battles of Custoza (24–25 July 1848) and Novara (23 March 1849) during the First Italian War of Independence. He retired at age 90 and was immortalized by Johann Strauss I's Radetzky March. Radetzky was born into a noble family of Czech origin at Chateau Třebnice (German: Trebnitz) near Sedlčany in Bohemia (now part of the town). Orphaned at an early age, he was educated by his grandfather, and after the count's death, at the Theresa Academy at Vienna. The academy was dissolved during his first year's residence in 1785, and Radetzky became a cadet in the Austrian Army. The following year he became an officer, and in 1787 was promoted to first lieutenant in a cuirassier regiment. He served as an adjutant to both Count von Lacy and Field Marshal von Laudon during the Austro-Turkish War of 1787–1791, and in the Austrian Netherlands from 1792 to 1795. In 1798 he married Countess Francesca von Strassoldo Grafenberg, from Tržič, Carniola (now in Slovenia). They had five sons and three daughters. Radetzky however also had a longstanding Italian mistress, named Meregalli, with whom he also had eight children, all of whom he recognized as his. In 1795 Radetzky fought on the Rhine. The following year he served with Johann Beaulieu against Napoleon in Italy, but disliked the indecisive "cordon" system of warfare which Count von Lacy had instituted and other Austrian generals imitated. His personal courage was conspicuous. At the Battle of Fleurus (1794) he led a party of cavalry through the French lines to discover the fate of Charleroi, and at Valeggio sul Mincio in 1796, with a few hussars, he rescued Beaulieu from the enemy. Promoted to major, he took part in Dagobert Wurmser's Siege of Mantua campaign, which ended in the fall of that fortress. As lieutenant-colonel and colonel he displayed bravery and skill in the battles of Trebbia and Novi (1799). At the Battle of Marengo, as colonel on the staff of Melas, he was hit by five bullets, after endeavouring on the previous evening to bring about modifications in the plan suggested by the "scientific" Anton von Zach. In 1801 Radetzky was made a Knight of the Military Order of Maria Theresa. In 1805, on the march to Ulm, he received news of his promotion to major-general and his assignment to a command in Italy under the Archduke Charles of Austria. He thus took part in the failed campaign of Caldiero. Peace provided a short respite, which he spent in studying and teaching the art of war. In 1809 he led a brigade in V Corps during the Battle of Eckmühl. Promoted lieutenant field marshal, he commanded a division in IV Corps at the Battle of Wagram. In 1810 he was created a Commander of the Order of Maria Theresa and became Inhaber of the 5th Radetzky Hussars. From 1809 to 1812, as chief of the general staff, he was active in reorganizing the army and its tactical system, but, unable to carry out the reforms he desired owing to the opposition of the Treasury, he resigned his position. In 1813 he was Schwarzenberg's chief of staff and had considerable influence on the councils of the Allied sovereigns and generals. Langenau, the quartermaster-general of the Grand Army, found him an indispensable assistant, and he had a considerable share in planning the Leipzig campaign. He won praise for his tactical skills in the battles of Brienne and Arcis-sur-Aube. He entered Paris with the allied sovereigns in March 1814, and returned with them to the Congress of Vienna, where he appears to have acted as an intermediary between Metternich and Tsar Alexander I of Russia, when the two were not on speaking terms. During the succeeding years of peace he disappeared from public view. He resumed his functions as chief of staff, but his ardent ideas for reforming the army came to nothing in the face of the general war-weariness and desire to "let well enough alone." His zeal added to the number of his enemies, and in 1829, after twenty years as lieutenant field marshal, it was proposed to place him on the retired list. The emperor, unwilling to go so far as this, promoted him general of cavalry and shelved him by making him governor of a fortress. But very soon afterwards the Restoration settlement of Europe was shaken by fresh upheavals, and Radetzky was brought back into the field of war again. He took part under Frimont in the campaign against the Papal States insurgents, and succeeded that general in the chief command of the Austrian army in Italy in 1834. In 1836, Radetzky was promoted to full field marshal. He was now seventy, but still displayed the vigor and zeal of his youth in the training and discipline of the army he commanded. But here too he was in advance of his time, and the government not only disregarded his suggestions and warnings but also refused the military the money that would have enabled the finest army it possessed to take the field at a moment's notice. Thus the events of 1848 in Italy, which gave the old field marshal his place in history among the great commanders, found him, in the beginning, not indeed unprepared but seriously handicapped in the struggle with Charles Albert's army and the insurgents in Milan and elsewhere. By falling back to the Quadrilatero and there, rebuffing one opponent after another, he was able to spin out time until reinforcements arrived, and thenceforward up to the final triumph at the Battle of Novara on 23 March 1849, he and his army carried all before them. He also commanded the Austrian troops who reconquered Venice after the year-long siege of the rebellious city in May 1848 – August 1849. He became a Knight of the Order of the Golden Fleece in 1848. His well-disciplined sense of duty towards officers of higher rank had become more intense in the long years of peace, and, after keeping his army loyal midst the confusion of 1848, he made no attempt to play the part of Wallenstein or even to assume Wellington's role of 'family adviser to the nation'. While as a patriot he dreamed a little of a united Germany, he remained to the end simply the commander of one of the emperor's armies. After his triumph in Italy, he was made Viceroy of Lombardy-Venetia from 1848 to 1857 - being the only one not of royal Habsburg blood. In spite of his success against Italian patriots, even in Italy he is not remembered unkindly: he was regarded as a fair ruler (for an enemy) and a gentleman who paid his debts. There is also a memorable anecdote of his meeting the man responsible for one of the most significant checks in the 1848 campaign, General Cesare Launier, shaking his hand, and congratulating him on getting "a bunch of kids" (much of Launier's command was made up of volunteer university students) to fight so hard that Radetzky and his men seriously thought they were facing crack professional Sardinian troops. Politically, he worked to reconcile the lower classes especially, to the Habsburg monarchy; he could see the Industrial Revolution coming and hoped to use the conflict of classes to isolate the patriotic party, made up mostly of the upper and middle classes, from the rising working class. He was ruthless in punishing rebellious soldiers – Hungarian troopers who had passed to the rebels' side in 1848 were not even shot, but hanged – and violent rebels, but very mild with unarmed opponents: patriot leaders of European renown, such as Giuseppe Verdi, Alessandro Manzoni and Antonio Rosmini, were allowed to live in peace in the kingdom, while Italy's other reactionary governments drove all their liberals into exile. Already in 1849, at the end of the siege of Venice, he had allowed the local patriot leaders to quietly slip away, and avoid public martyrdom. This was probably the best policy that Austria could possibly adopt in the circumstances, but it was doomed anyway; the events of 1848-49 had dug too deep a chasm between the Italians and the Austrian government, and - as events in 1859 showed - it was only the power of Austrian military might that kept Austria and her client states in Italy. It was part of Radetzky's good fortune that he died one year before his whole work dissolved. Josef Wenzel Graf Radetzky of Radetz died from pneumonia on 5 January 1858 in Milan. The Emperor wished that he be buried in the Capuchin crypt (the Imperial Crypt in Vienna), however, Radetzky had bequeathed his earthly remains, and the right to bury him, to Joseph Gottfried Pargfrieder, an army supplies merchant and land owner, who decades earlier had settled his debts. On 19 January 1858, Radetzky was buried at the Heldenberg Memorial site (Gedenkstätte Heldenberg) in Lower Austria, an open-air pantheon with warrior statues celebrating the heroes of Austrian military history from Middle Ages to the 19th century (Heldenberg literally translates as "Hero Mountain"). Radetzky lies buried in a crypt under a monumental obelisk in the central part of the pantheon, together with Field Marshal Maximilian von Wimpffen and Pargfrieder himself. In military history Radetzky's fame rests arguably on one great achievement, but in the history of the Austrian army he figures as the frank and kindly "Vater Radetzky" whom the soldiers idolized. In the year following his death, another and greater Italian war broke out, and his beloved army disintegrated and was defeated in every encounter. The first memorial of Radetzky was built in Prague, on Malostranské náměstí. It was planned already during his life, since the Battle of Novara in 1849. It was first designed in 1851 by the painter Christian Ruben and later sculpted by brothers Emanuel Max (statue of Radetzky) and Josef Max (statues of soldiers). The memorial was unveiled several months after Radetzky's death, on 13 November 1858. It was regarded as one of the most beautiful memorials in Prague. Radetzky was popular among the Czech people as a great compatriot. This however changed after World War I and the creation of Czechoslovakia, when the new republican government despised all reminders of the old Habsburg monarchy. So the Radetzky memorial was first covered and then in May 1921 dismantled, after standing on its site for 63 years. The statue is now exhibited in the Lapidarium of Czech National Museum. Since the fall of Communism, Czechs are rediscovering Radetzky's legacy. Spolek Radecký Praha (Radetzky Association Prague) was founded by architect Jan Bárta, aiming to commemorate field marshall Radetzky and especially advocate for the restoration of his memorial in Prague. In 2016 (the 250th anniversary of Radetzky's birth), great celebrations were held in Prague and Sedlčany (his birthplace) and on the town museum in Sedlčany a new commemorative plaque was unveiled by the association. An international architectural competition for a revitalization of Malostranské náměstí in Prague was held in 2014 and the winning architectural design contained the rebuilt Radetzky memorial, but the memorial was subsequently removed from the project by municipal politicians. Radetzky was intimately connected with the Duchy of Carniola, because of his wife and because he owned much land there. His courage was praised in folk songs. The first representative statue in Ljubljana, the capital of Carniola, was a statue of Radetzky. It was placed in the most elite location, the Congress Square, and all main public events took place in front of it. As he owned the Tivoli Castle in Ljubljana, the capital of Carniola, he greatly contributed to the arrangement of Tivoli Park. Joseph Radetzky von Radetz: Briefe des Feldmarschalls Radetzky an seine Tochter Friederike 1847-1857; aus dem Archiv der freiherrlichen Familie Walterskirchen hrsg. von Bernhard Duhr: Festschrift der Leo-Gesellschaft zur feierlichen Enthüllung des Radetzsky-Denkmals in Wien. Wien: J. Roller, 1892. These are Radetzky's letters to his daughter Friederike Radetzky von Radetz, Gräfin Wenckheim, published to celebrate the unveiling of the Radetzky monument in Vienna. ^ Announcement of Death. In: Militär-Zeitung, 6. Jänner 1858, p. 01 (Online at ANNO)Template:ANNO/Maintenance/mil. ^ "Poklon je izvrstna samopromocija" [A Gift is a Superb Self-Promotion]. Dnevnik.si (in Slovenian). 30 October 2010. Chisholm, Hugh, ed. (1911). "Radetzky, Josef" . Encyclopædia Britannica (11th ed.). Cambridge University Press. Wawro, Geoffrey. "An 'army of pigs': The technical, social, and political bases of Austrian Shock Tactics, 1859-1866." The Journal of Military History 59.3 (1995): 407. Lang, Zoë. "The Regime's ‘Musical Weapon’Transformed: The Reception of Johann Strauss Sr's Radetzky March Before and After the First World War." Journal of the Royal Musical Association 134.2 (2009): 243-269. Alexander Lernet-Holenia: Radetzky: Schauspiel in drei Akten. [Frankfurt am Main]: S. Fischer, 1956. Wikimedia Commons has media related to Count Johann Joseph Wenzel Radetzky von Radetz. "Radetzky, Joseph Wenzel, Count" . New International Encyclopedia. 1905.